Add on a luxury African adventure to your cruise from Cape Town. My life is a cruise-related juggernaut. I’ve lived, slept, and breathed cruises for more than 35 years. Every day of my life is consumed with recurring cruise narrative and I love it. A major portion of my travel history is documented on water, so when I venture out of my nautical realm and embark on a new odyssey, it has to be something compelling. No, this odyssey is not the name of a new cruise ship, but an extravagant land-based African safari adventure. Cape Town presents itself as the opening scene to an epic South African adventure expertly curated by Journeys Unforgettable in association with Wilderness Safaris. A culturally diverse city, Cape Town boasts beaches, art, and natural beauty topped off with fine wines and world-class cuisine. 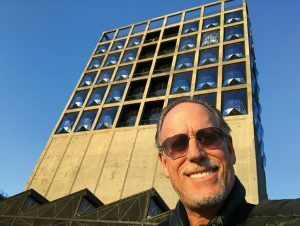 It’s only fitting that the choice of accommodation was The Silo Hotel, an eclectic hotel that occupies the upper portion of the historic grain elevator complex and sits directly atop the impressive Zeitz Museum of Contemporary Art Africa. Twenty-eight trendy suites, each designed in a chic industrial style, feature the property’s renowned pillowed window bays with commanding views of iconic Table Mountain and the V&A Waterfront. These domed lunettes are comprised of 56 hand-cut panels of glass reaching up over 16 feet in height and stretching out three feet, which proffers multidirectional views. If you were to choose where to stay in Cape Town, it would be the V&A Waterfront, an area pulsing with life, shopping, and superb dining. While these gratifying diversions may call out to many, attention eventually gravitates back to the posh appeal of the hotel. A swim in the rooftop pool, hovering 11 stories upward, captivates the essence of the hotel’s swank allure. Spirited design in furnishings and luxurious style meld seamlessly into the industrial architecture of the building. 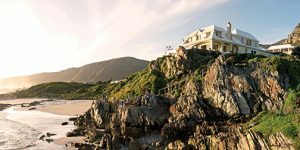 Three days of leisure indulgence and cultural immersion at The Silo is the perfect preamble to the next component of the itinerary: two nights at the cliff-top Birkenhead House. Both of these exquisite properties are part of The Royal Portfolio, a consummate collection of award-winning hotel and resort accommodations. The tandem talents of founders, Phil and Liz Biden, have produced unparalleled accomplishments in creating their highly acclaimed hotels in fascinating locales. Mrs. Biden has employed her significant talent of imaginative design into the meticulous style displayed in every room, nook, and cranny, exposing her keen eye for flair, reflecting the vibrancy and indigenous colors of South Africa. In stark contrast to the cosmopolitan Silo, the quirky Birkenhead House is a seaside paradise flaunting its intimate ambiance with only 11 rooms. Weaving unmistakable opulence with serendipitous casualness creates the perfect retreat away from urban bustle. Celebrated worldwide as an outstanding whale-watching destination, the hosting town of Hermanus is set against a backdrop of mountains and shimmering seascapes. Whether you prefer an active lifestyle or relaxing rejuvenation, the myriad of options is endless. Surfing, hiking beautiful mountain paths, horseback riding on the beach, or shark-cage diving exemplify a robust menu of activities. If your druthers lean toward wine tasting, the country’s Hemel-en-Aarde Valley is just a short drive away. The property itself holds a puissant allure. There’s no need to venture beyond the immaculate grounds, as the all-inclusive policy translates to all extravagant meals and drinks provided. The in-house spa adds another element, soothing your body’s stress as well as your inner soul’s detoxification. After these luxurious precursors, a transfer to Botswana and six days and nights of safari adventure is provided by Wilderness Safaris with an opportunity to place your fingers on the beating pulse of Africa, bombarding the senses with an eye-opening assembly of the unfamiliar. I was never a Boy Scout and my camping experiences are limited to say the least. The prospect of sharing my space with beasts of nature seemed to be slightly out of character. The word hesitancy might be a little too understated. That tempered thought was quickly dispelled on arrival at Kings Pool, the first in a series of three luxurious camps that go well beyond the inferred, glamping. Each respective Wilderness Safaris camp invokes calm and relaxation in the midst of nature’s circle of life. The company ensures that guests are treated to an authentic, yet pampered, experience with its inventive and well-guided safari expeditions. The inherent animation of Disney’s The Lion King is reset to real life, witnessing staggering displays of bush environment. Nine authentic and exquisite en-suite rooms are strategically set alongside the Kings Pool Lagoon. Although designed with thatch and canvas and inspired by regional tradition, there is no inference to being modest. Each suite features a spacious bedroom area, lounge, en suite bathroom, and even a small pool. The unplugged ambiance is underscored by the communal open-air lounge peering out to the never-ending horizon. Set the five-star experience aside for a fleeting moment as night reveals a million star encore with unfettered views of the heavenly display above. Wildlife viewing is facilitated by an exhilarating drive through the bush, punctuated with up-close sightings of lions and wild dogs, hippos, and warthogs, a virtual Who’s Who of the animal kingdom. The camp is famed for its dense population of elephants and the unique ground level hides that provide an exceptional viewing perspective of these giant creatures. The quintessential soundtrack of nature is routinely heard around the camp’s environs and, as if on cue, the adjacent lagoon provides an audible welcome to the camp as partially submerged hippos engage in highly audible courtship rituals. And check thoughts of campfire hot dogs and burgers at the door, because culinary creativity is the menu du jour. After two exhilarating days at Kings Pool, the luxury camp of Vumbura Plains eased the melancholy feelings of leaving such a wonderful base for adventure. Set in the very heart of the Vumbura Reserve, each of the eight deluxe rooms is on raised wooden deck platforms complete with private pool. A verdant canopy of indigenous Jackalberry trees shade the main lounge, dining area, and pub, which creates an exotic setting and jungle-like ambiance. The diverse wildlife viewing of the floodplain only adds to the real-life drama. The intimate size of the Vumbura Plains camp enforces low-density human encroachment, which translates into high-density wildlife viewing. 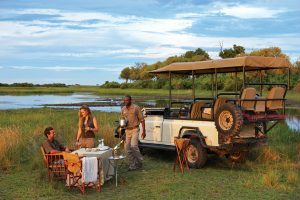 The camp offers a wide variety of safari travel modes including open Land Rover, mokoro (a dugout canoe and the traditional mode of transport within the Okavango Delta), cruises through the flood plains by motorboat, and even escorted walking hikes. Being situated in the northern delta with water channels, grasslands, and deep forests provides essential habitat for wildlife of all shapes and sizes. Just when you think things can’t get any better, we’re whisked off deeper into the Okavango Delta and the lavish Abu Camp. Six ultra-luxurious suites that overlook lagoons and floodplain provide eye candy for the senses, but the one-on-one encounters with the resident herd of rehabilitated elephants compete for star billing. Day or night safaris serve as gateways into outstanding animal interaction. Our personal journey into the bush exposed food chain reality, as hyenas feasted on the mud-marinated remains of a less fortunate water buffalo. The edge of raw adventure is smoothed over with the comforts of convenience and luxury surrounded by nature, reminiscent of an Out Of Africa movie set. Bedroom spaces are dressed in elegant comfort without compromising the spirit of exploration, coaxing out your inner Livingstone. Spontaneous entertainment comes in the form of audible serenades by neighboring wildlife and their nighttime rituals. Daytime heralds in adventurous elephant encounters of the extreme kind. Walk alongside or cruise with traditional mekoro, as the gentle but potent creatures go about their daily lives. This camp is a highly acclaimed facility that has provided sanctuary for dozens of rescued, rehabilitated, and eventually released elephants. 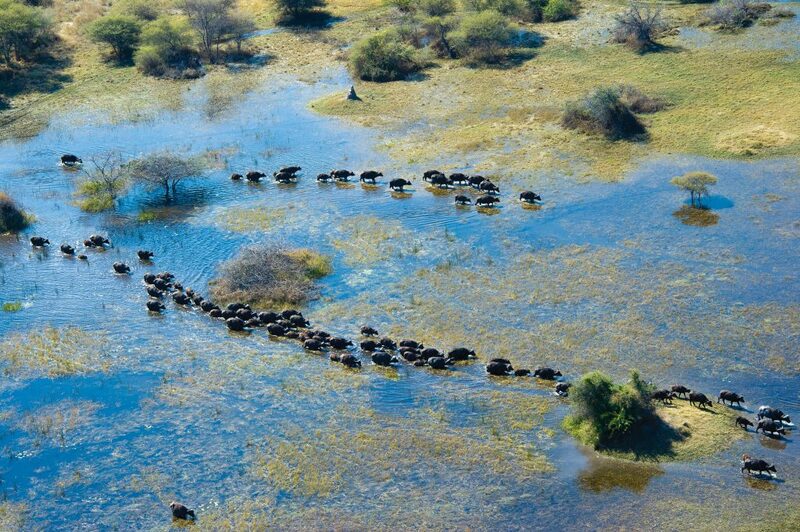 Botswana offers exceptional introspect into the bush environment and its inhabitants. With memories for a lifetime, focus now turns toward Kenya and as transit involves a brief flight, an all too short stay at the Intercontinental Hotel at the Johannesburg airport came as a wonderful surprise. Never before have I experienced an airport hotel with such character. The ambiance is first class and service and food far exceeds the often average experience provided by many airport properties. Exclusivity is a word that can be tossed around easily when describing solitude and fashionable surroundings, but the opulent oasis of Segera goes well beyond that simplistic description. A step into an unimaginable world and surrounded by inspiring nature sums it up. An exhaustive Google search would never discover words that adequately captivate its extravagant appeal. Prior to arrival onto Segera’s private airstrip, the overhead view exposes an intimate complex of six timber and thatched villas encircled by lush landscaping, a centerpiece swimming pool, and breathtaking views of Mount Kenya as a backdrop. Unforeseen class is complemented by the property’s extensive African art collection, thanks to the discriminate eye of visionary owner, Jochen Zeitz. Fabulous paintings and sculptured art create a gallery comparable to museum-quality masterpieces. In fact, Zeitz is responsible for the creation of his namesake contemporary art museum in Cape Town. The main villa was initially the owner’s private home, but eventually opened to public reservations, which established jobs and a deeper engagement with the surrounding populace. The retreat prides itself on its extensive contribution to the preservation of not only threatened wildlife, but also the region’s delicate ecosystems. The surrounding 50,000 acres of game sanctuary provide habitat for lion, leopard, buffalo, giraffe, and zebra along with an assortment of plains game that complete the structure and natural balance of life in the bush. Paramount to the wildlife allure is the unrestricted hierarchy of complex animal survival. Our first outing revealed a lioness dragging a defeated wildebeest into the bush, a testament to the reality of environmental existence. Getting away from it all is an understatement. Getting into it all is expedited by an extensive portfolio of luxury properties throughout Africa. Urban dwellers can rejoice. 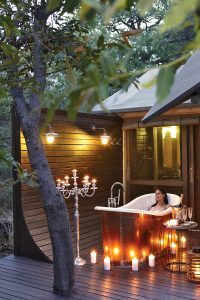 Bush elegance is exactly what the doctor ordered, barefoot luxury in an escape for the soul’s rejuvenation. 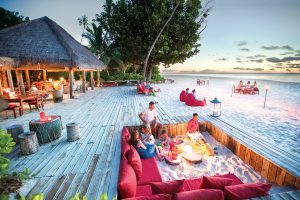 After the surreal world experiences of Africa, a three-night decompress at the exclusive North Island in the Seychelles prepares you for reentry into the real world. Absorbing an adventure of this magnitude requires significant gigabytes of mental memory and this ultra-luxe resort provides the perfect venue for a decadent debriefing. The white-sand beaches, turquoise sea, and lush tropical forest create a hedonistic haven that induces meditative reflection on the experiences of the past few days. Whatever your vision of a perfect vacation, North Island is dedicated to every whim and desire, rendering a perfect fusion of energy and relaxation, refined casualness, and extravagance in a lavish tropical setting. Guests are provided with North Island buggies for opportunities to explore and discover at their own tempo. Exceptional snorkeling and diving activities abound on vividly colored reefs, and to re-establish your fitness regimens the resort features yoga classes, a fitness center, and all-encompassing spa treatments. This two-week adventure into extravagance and indulgence is a game changer for preconceived notions of packaged vacations. I have traveled for most of my adult life and never have I experienced the level of luxury exemplified by this collection of five-star properties. The planning skills of Journeys Unforgettable coupled with the properties of Wilderness Safaris produce a worry-free and refined holiday extravaganza that is second to none. Hakuna Matata … no worries for the rest of your days! Getting to Cape Town, South Africa, is not as easy as a short drive to a U.S. port, but a flight from New York aboard South African Airways is immensely more enjoyable. The service on the flag carrier of the country is reminiscent of cruise line hospitality and the staff are exceptionally welcoming. Rather than dreading the long return flight home, I actually looked forward to it. You’ve likely heard the phrase, “It’s not personal, it’s just business.” Just business? With South African Airways business, nothing could be further from the truth. Its highly acclaimed business class is all personal. Personal attention, personal service, and personal space unlike any other. Offering service from select U.S. cities as well as a host of international cities, a flight with SAA becomes a journey into refined luxury. This airline could better be described as a flying hotel, transporting you to your destination in legendary comfort. Factor in VIP treatment in airport lounges, onboard amenities, and a reclining seat that transforms into a restorative bed assuring that you arrive fresher than when you left. The airline is proud owner of the distinguished A330-300 aircraft. Each business-class seat features a 15-inch state-of-the-art touchscreen entertainment system with more than 100 movies and a wide variety of TV programming designed to keep you entertained throughout your flight. In testament to the company’s recognized esteemed status, two of South Africa’s renowned chefs, Reuben Riffel and Benny Masekwameng, have been empowered to create signature meals that rival those found in highly rated restaurants. When you’re ready to sleep, the refined luxury liner’s business class features a newly designed flat bed that’s nearly six and a half feet long with increased privacy and substantial personal storage space. Nestling up under a cozy duvet with a plush pillow defines the essence of privilege in flying with SAA, reemerging at your destination invigorated with a new lease on life. As a member of the Star Alliance, premium passengers have access to hospitality lounges in select cities within the company’s expansive destination peripherals. Catch up on work or simply relax away from the crowds with undisputed ambiance. Flying becomes an integral part of any long-distance travel plans and traveling with South African Airways makes it a pleasure to look forward to. A master chef’s talent lies in the ability to mix specific ingredients to achieve culinary excellence. So too, a competent travel planner must know how to blend explicit travel components into phenomenal, worry-free itineraries. Booking basic flights and accommodations requires minimal effort, but achieving travel excellence demands first-hand knowledge of destinations and competent people to execute flawless arrangements employing exceptional organizational skills. Journeys Unforgettable prides itself more on being a personal concierge service than simplistic travel planner. Founding partners, Brennan and Steve Rimer, who originate from Southern Africa, live and love Africa and are truly dedicated to arranging these once-in-a-lifetime experiences. Traveling a few times annually to Africa’s finest destinations is imperative to their commitment of knowledge and wanderlust. Knowing their clients as much as the locale translates into personalized design. Constructing a tailor-made itinerary of multiple flight segments, lodges, and hotels with precise detail, resulted in an infallible outcome to our surreal African adventure. Dream vacations tend to be personal ambitions rather than off-the-shelf, packaged holidays. Passion is on full display as they work their magic on intimate details that they are privy to. Their close, working partnerships with premiere wildlife lodges and hotels affords them the access to exclusivity at its best. The fluidity of safari adventure calls for special insight into where and when to travel. Having this expertise and affiliation provides the trained staff with the ability to design itineraries that will assure the loftiest of expectations for passionate, adventurous, and luxury-seeking travelers. Trust is well rewarded with Journeys Unforgettable. Visit the Journeys Unforgettable website to plan your next adventure. 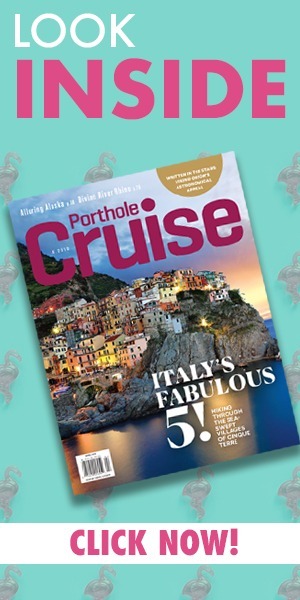 To subscribe to Porthole Cruise Magazine, click here. Wow. What a wonderfully written article.